TheNuts - March Madness Bet the Action! March Madness - Bet the Action! March Madness is happening now! As the field narrows from The Sweet 16 to The Final 4 things are about to get nuts. This is one of the craziest sporting events of the year, where the best college basketball teams from across the USA square off in head-to-head, single elimination play to determine the National Champion. The action is fast, furious, and available all weekend. Place your bets. March Madness is the second most popular event of the year for wagering on sports second only to the Super Bowl and TheNuts has you covered with plenty of options. 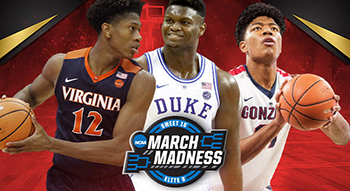 Check out these leading sportsbooks for all the lines, props, and futures you need to give the Madness a little something extra. Bovada - Servicing players form the United States, Bovada offers an exceptional list of betting options from standard game lines to the craziest props. New sign-ups will be welcomed with a 50% up to $250 bonus. Sign-up here. BetOnline - One of the flagship brands on the USA-friendly Chico Network, BetOnline provides an ideal environment for players to do just that… Bet Online. No matter what type of bet you’re feeling they’ll have odds for you. An enormous 100% up to $1,000 bonus awaits. Use Code: SLAM19. Get started. Bodog - Having recently expanded to include both Canada and the Latin America regions, Bodog is one of oldest and most well respected sportsbooks in the industry. A 100% up to $200 bonus awaits new sign-ups - create your account today. Think you know who's making it to the Elite 8? The Final 4? Bet the action!